When they first made a comeback, I took a pass on overalls– too young, not always flattering. But, this pic of model Caroline Brasch Nielson could sway me. In cream with a neutral sweater is super chic, and ageless. I agree, if the look is carefully crafted, It can be a great casual look. I used to have a natural linen pair I loved wearing in the summer. Overalls? Never, sorry! Much too down on the farm to ever be chic. I agree, just say no! Oh, say it ain’t so please…..
No! It belongs with camouflage and neon…in the trash! To me, these fall into the category of “if you wore it back in the day, don’t wear it now” . I think it really is a young girl’s look and trendy at that. Also think it looks best on a certain body type – very tall and lanky. Sorry to be so negative, but on this look, I’m quite opinionated! Thoughtfully put together as above and definitely in white I would consider it. Not then, not now. Period. Definitely not ageless. Instead, could be very aging. Really? Not super chic or ageless unless you happen to live on a farm or be working in your garden. Love it if I were tall and lanky, which I am not. But I do paint in denim overalls in the winter….. Uh oh, another step back to hippiedom . . . And who’s back side really looks good in overalls? Our mutual friend, Mark Sikes, will disagree on this subject, but I think the idea of a woman wearing overalls is not good. Reminds me of a giant toddler or rodeo clown. Just a trend invented by the fashion industry. 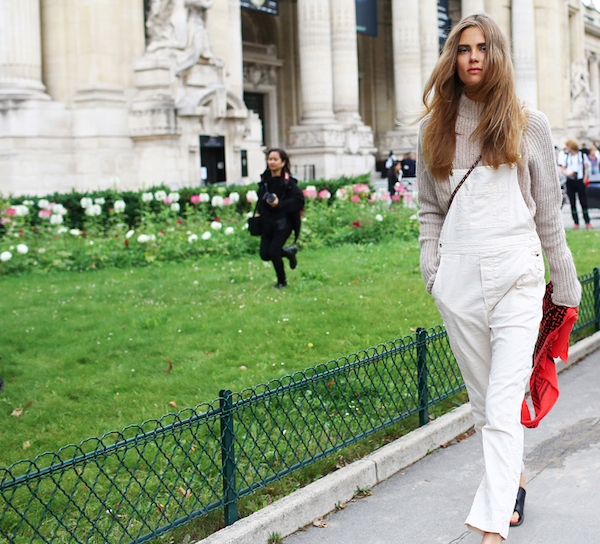 Overalls are not for a mature stylish woman. Definitely for the under 30 set. To me, they seem very unflattering! Correction: just saw a pic of Katie Holmes in a denim pair I’m not a big fan of how she puts herself together but I thought the overalls were adorable on her. A really cute casual look! I ran across a picture of Olivia Palermo in a black pair of overalls and an over sized white blouse. Not for everyone, but definitely not tacky.